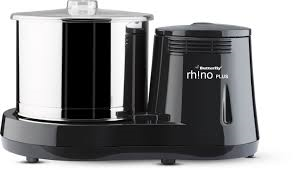 Butterfly Rhino Plus wet grinder is must have if you want an appliance that will help in efficiently making a smooth batter for any occasion. This wet grinder equipped with a single speed setting and runs on a single phase motor (high torque) that can prepare sufficient quantity of batter in a short time with minimum effort. To get this product delivered to your doorstep, order it on Snapdeal. This appliance is equipped with a single stainless steel drum which houses the detachable roller stones. The material of the drum is durable and can be used for a long period of time. It has a capacity of 2 litres which is ample capacity for all your regular grinding needs. The drum can be detached easily from the body which makes it easier to clean after use. It is equipped with a clear polycarbonate lid that is break-resistant. The Butterfly wet grinder consists of two roller stone assemblies which have the ability to grind rice/dal to a fine batter. Due to their efficient operation, the stones can give you a uniform consistency throughout the batter. As they are detachable, you can easily remove and clean it after use. To avoid formation of rust and corrosion, Butterfly grinder body is made out of ABS (Acrylonitrile butadiene styrene) plastic. ABS has unique properties such as resistance to chemical reactions and ability to withstand minor physical damages.